While the Lakers and Celtics are undeniably the most celebrated franchises in professional basketball- and rightfully so- the incredibly consistent San Antonio Spurs are deserving of a spot atop the next tier. In 43 seasons in the both ABA and the NBA, the Spurs have reached the playoff 38 times, and even the lean years were fruitful. Of the five times the Spurs have missed the postseason, two of them resulted in David Robinson and Tim Duncan! To be fair, three of their playoff trips came in seasons sub-.500 seasons- as the ABA’s Texas Chapparrals in 1970-71 (30-54; yikes!) and under their current name in 1985-86 (35-47) and 1987-88 (31-51; Ugh!). While those are some sorry records and none of those team went on to win a postseason game, we can’t blame the Spurs. They played the games on the schedule and somehow reached the playoffs. 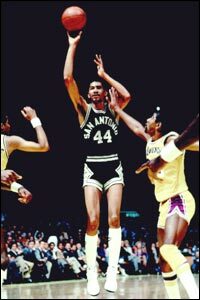 The Spurs joined the NBA in 1976, and proceeded to reach the postseason in nine of their first ten seasons, including the first seven consecutively. In those first seven seasons, the Spurs made three trips to the conference finals- the Eastern Conference Finals in 1979 (lost to Washington in seven games), and after realignment, the Western Conference Finals in 1982 and 1983, falling to the Lakers each time. The Spurs of the late 1970s and early 1980s were led by George Gervin, who received some excellent supporting performances, first from Larry Kenon and James Silas, and later from Mike Mitchell and Artis Gilmore. In 1986-87, the Spurs, now with their star power and attendance fading quickly, missed the playoffs for the second time in four years with a 28-54 record. However, as we’ve come to learn, even when the Spurs lose, there tends to be a silver lining. That spring, the Spurs won the top pick in the 1987 draft in the draft lottery, a pick used to select David Robinson, a superstar center from the U.S. Naval Academy. Although Robinson was drafted in 1987, he wouldn’t join the Spurs until the 1989–90 season, due to a two-year commitment to the Navy. The Spurs dodged a bullet in the final months of Robinson’s Navy commitment, as there was speculation he might choose to spurn the Spurs and to become a free agent. However, the Spurs wound up hitting the jackpot for the second time in three years, as Robinson ultimately chose to take his talents to the Alamo. The arrival of “Mr. Robinson” in 1989 catapulted the Spurs to the upper echelon of the NBA. After winning just 52 games in the two seasons prior to Robinson’s debut, the Spurs have won 52+ in 16 of 21 seasons since- logging win totals of 47, 49 and 50 in three of those sub-52-win seasons. 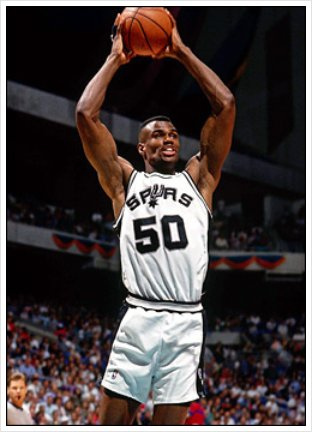 Another of these seasons- the Spurs’ only sub-.500 season in the past 21 years- came in 1996-97, with David Robinson playing in just six games as the Spurs stumbled to an atrocious 20-62 record. Fear not Spurs fan! The trust ping-pong balls will come to your aid. And come to the Spurs’ aid they did! The franchise won the top pick in the 1997 draft, can’t-miss big man Tim Duncan. The following season, with a healthy Robinson and uber-rookie Tim Duncan, the Spurs quickly returned to the NBA’s top tier, winning 56 games and reaching the second round of the playoffs. Now, remember those five sub-52-win seasons? The last of these came in 1999, when the Spurs won just 37 games. Oh yeah! The lockout-shortened 1999 regular season consisted of just 50 games, of which the Spurs won 74% of their games (37-13), before going on to secure the first of their four NBA championships. In short, the Spurs’ run over the past 21 years has been nothing short of exceptional. 20 winning seasons. 20 trips to the playoffs. One season with a winning percentage under .573. Seven conference finals appearances. Four NBA championships. Not bad, huh? And while David Robinson is long gone, Tim Duncan is on the 16th fairway of his nearly flawless career, Manu Ginobili looks to be fading and Tony Parker’s days with the franchise may be numbered, Spurs’ fans have plenty to be thankful for. Plus, there’s always the ping-pong balls. From both an individual and team standpoint, Tony Parker is far and away the greatest point guard in Spurs history. Parker joined the Spurs in 2001, and was almost immediately made a starter. 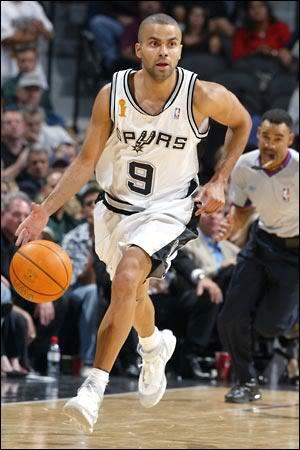 He took over for Antonio Daniels and Avery Johnson, the lead guard for the Spurs’ first title run. As a 19 year-old rookie, Parker averaged 9.2 ppg and 4.3 apg for a 58-win team that advanced to the conference semifinals, before falling to the eventual champion Lakers in five games. Parker efforts did not go unnoticed, as he was named to the NBA’s 2002 All-Rookie First Team. The following year, both Parker’s game and his role on the Spurs grew considerably. As the Spurs marched to 60 wins and the second of their NBA titles, Parker averaged 15.5 ppg, 4.3 apg and collected his first ring. In light of this- two titles in five years, the second with a lightning-quick, rapidly improving 21 year-old PG with a small cap number- the Spurs naturally did what anyone would do… try to replace him for an exiting-his-prime Jason Kidd at 15-20x the salary! Huh? Fortunately for all parties involved (except maybe Kidd), a deal was never consummated, opening the door for Parker to continue his development. After a slight dip in scoring in his third year, Parker emerged in 2004-05 as a legitimate offensive weapon and a better playmaker, putting up 16.6 ppg and 6.1 apg as the Spurs racked up 59 regular season wins and captured the 2005 title. Now an established championship-caliber lead guard, Parker completed “the leap” in 2005-06, averaging 18.9 ppg- 5.8 and kicking off a four-year stretch that included three All-Star selections (2006, 2007 & 2009), a career-high 22.6 ppg (2008-09) and a third championship ring and accompanying Finals MVP award in 2006-07. After nine seasons, Parker ranks second among Spurs backcourt players in games played (668; 41 behind Gervin), points (11,113), third in assists (3,772; 93 behind #2) and FG% (49%), and fourth in rebounds (2,038; 50 away from #3). One of the most one-dimensional superstars in NBA history- but, man, was he good in that one dimension! Gervin’s scoring average with the Spurs is more than a point better than his career average of 26.2 ppg- which is good for fifth in NBA history. George Gervin is one of the deadliest and most versatile scorers in NBA history, using his wiry frame to slither into the lane for his patented finger roll, as well as his incredible length to get off his mid-range jumper. 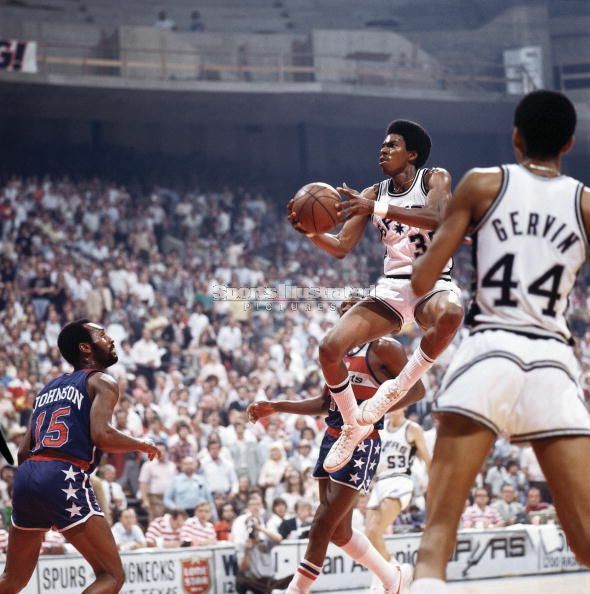 Gervin used his overflowing arsenal to capture three consecutive scoring titles between 1978 and 1980, posting a career-high 33.1 ppg in 1980. However, the most famous of the three scoring titles came in 1978, when Gervin led Denver’s David Thompson by a fraction of a point entering the season’s final day. Although Thompson managed an incredible 73 points that day, Gervin maintained his slight lead by scoring 63 points (including an NBA-record 33 points in a quarter, since tied by Carmelo Anthony) in less than three quarters. When all was said and done, Gervin edged Thompson for the scoring title by less than a tenth of a point (27.22 to 27.15). The “Iceman” was an All-Star in all 11 of his 12 seasons (twice in the ABA, nine times in the NBA) as a member of the Spurs, winning the 1980 All-Star MVP, and earned five consecutive All-NBA Team selections between 1977 and 1982. During that stretch he averaged at least 29.6 ppg three times (30+ twice) and no worse than 27.2 ppg, 5 rpg and 49.2% FG. Gervin ranks in the top four in franchise history in games played (709), points (19,383), FG made (7,526), FT attempted (5,061) and made (4,258)rebounds (3,392) and steals (892). With Gervin on the team, the Spurs reached postseason 11 times in 12 seasons and made three appearances in the conference finals. In 52 career postseason games with the Spurs, Gervin averaged 28.5 ppg and 5.8 rpg. Also deserving a mention here are Manu Ginobili and Alvin Robertson. In his eight seasons, Ginobili’s averaged 15- 4- 4 and won three rings with the Spurs. More than that, however, he’s incredible at getting into the lane, is often the best clutch player on the floor and seldom fails to deliver a spark when the Spurs are in need of one. Meanwhile, Alvin Robertson, was the best player on some unremarkable teams in the 1980s and is one of the greatest defensive guards in league history. In his 389-game run with the Spurs, Robertson averaged 16.2 ppg, 5.4 rpg, 5.4 apg and an awesome 2.9 spg, was named an All-Star three times, and won both the Most Improved and Defensive Player of the Year awards in 1985-86. This was a brutally tough call. Sustained, solid play over a longer stretch, accompanied by a ring? Or a shorter run of individual excellence in a franchise’s formative years, accompanied by considerable, but lesser, team success? This has not been an uncommon question during this creation of this series, and as usual, there is a case to be made for both sides. While you generally don’t want to go against the guy who recovered from a kidney transplant, Sean Elliott, the third overall pick in the 1989 draft, finished a very close second. In his younger days, Elliott was one of the most explosive small forwards in the NBA and was essentially a one-team man. He spent eleven of twelve professional seasons in San Antonio, with the exception of a one-year stint in Detroit- after which he rejoined the Spurs. Elliott finished his Spurs career averaging 14.4 ppg and 4.3 rpg, and is the franchise leader among forwards in 3-pointers made (563) and attempted (1,485), while ranking second assists (1,700) and third in points (9,659), rebounds (2,190) and steals (522). His 9,659 points place him fourth in franchise history, while his 669 games played are good enough for third, although Tony Parker sitting at 668 is likely to bump Elliott to fourth by the first week of November. Elliott was a two-time All-Star as a Spur (1993 and 1996) and was not only a key member of the franchise’s first title in 1999, but is single-handedly responsible for that season’s signature moment, the “Memorial Day Miracle” as it’s known in San Antonio. In the final seconds of Game 2 of the conference finals against the Trailblazers, Elliott hit a go-ahead 3-pointer from the tips of his toes, with his heels hovering over the out-of-bounds line, after the inbounds pass to him was nearly stolen. After the championship run, Elliott announced that he had played in the 1999 postseason despite a kidney disease, and that he’d require a transplant. He returned in March 2000, becoming the first player to return after a kidney transplant- Alonzo Mourning has done it since. in a game against the Atlanta Hawks. He announced his retirement in 2001. As compelling a case as Sean Elliott’s is, the nod here goes to Larry Kenon, another bridge between the Spurs’ ABA and NBA days and an explosive star in the team’s early years. At 6’9”, 205, Kenon had the perfect body for an ABA-era slasher and was right at home with the Spurs. After averaging a double-double in consecutive seasons with the New York Nets, Kenon joined the Spurs in their last ABA season, where he averaged 18.7 ppg and 11.1 rpg, was named an All-Star and partnered with George Gervin and James Silas to form the offensive backbone of the 50-win team. While Gervin’s name is far more prominent in NBA history, he and Kenon were very much a 1-2 punch in their time together. In each of their four post-merger seasons as teammates, each man averaged at least 20 ppg. In the Spurs’ inaugural NBA season, Kenon raised his game, averaging 21.9- 11.1. This was his first of four consecutive 20+ ppg seasons with the team. He would go to average at least 9.5 rebounds in each of the next three seasons, two of which saw Kenon selected to the All-Start team. Kenon’s 21.2 ppg is the third highest scoring average in Spurs’ history (0.2 behind Duncan), and his 10.1 rpg ranks third among forward (behind Dennis Rodman and Tim Duncan). Larry Kenon and Tim Duncan are the only forwards in history to average a double-double in their time with the Spurs franchise. Also, in terms of both individual and team accomplishments, and the consistency and efficiency with which they were achieved, Tim Duncan’s career is as close to flawless that of any player in league history outside of Russell and Jordan. Looking at his relationship with his coach and franchise, Tim Duncan’s legacy with the Spurs is eclipsed only by that of Russell’s with Red Auerbach and the Celtics. His treatment of his teammates, fans and coach Gregg Popovich, and the reverence with which they all speak of him, is almost unheard of in the modern world of sports. In his 13-year career, Duncan’s averaged under 19.3 ppg just once, never average less than 10 rpg, and during his five-year prime was an absolute lock for 23- 12 and ~2.5 blocks. During that span he’s won the 1998 Rookie of the Year award, been selected to 12 All-Star teams (there was no game in 1999), won the 2000 All-Star MVP, named All-NBA First Team nine times, All-NBA Second Team three times, All-Defensive First Team eight times, All-Defensive Second Team five times, won back-to-back MVPs in 2002 and 2003 and been the best player on four championship teams in an nine-year span, winning Finals MVP three times. That is one accomplished sentence! Duncan is the franchise’s all-time leader in defensive (8,322) and total rebounds (11,335), and is second in games played (977), points (20,641), offensive rebounds (3,013) and blocked shots (2,235). In Spurs’ history, Only David Robinson has played more games, grabbed more offensive rebounds or blocked more shots than Timmy, while only the Admiral and Iceman have scored more points in a Spurs’ jersey. However, most of these marks will not last long, as Duncan will take his rightful place atop most of these lists once he’s got 11 games played, 150 points and 70 offensive rebounds in 2010-11. In addition to being perhaps the most intelligent and articulate player in league history, the Admiral is one of the greatest centers of all-time. Robinson was the franchise’s first post-Gervin superstar and is solely responsible for changing the fortunes of the Spurs and perhaps even saving basketball in San Antonio. His spectacular, athletic play, seldom if ever seen from a man his size, was incredible to watch. He was capable of blocking a shot at one end, outrunning everyone in transition and outjumping anyone tasked with trying to stop him near the rim. And if that didn’t create enough of a matchup nightmare, he could handle the ball a bit and had 15-foot range on his jumper. The top pick in the 1987 draft, Robinson served the final two years of a U.S. Navy commitment before joining the Spurs. Upon joining the team as a 24 year-old rookie, Robinson was immediately one of the NBA’s most dominant players, winning Rookie of the Year, averaging 24.3 ppg,12 rpg and 3.9 bpg while leading the Spurs to a 35-win improvement from the previous season. In his first seven NBA seasons, Robinson was an absolute force, never averaging less than 23.2 ppg and 10.7 rpg. In 14 seasons with the Spurs, Robinson averaged 21.1 ppg, 10.6 rpg and ~3 bpg, earned 10 All-Star selections, was named All-NBA first Team five times and won the 1995 MVP and the1992 Defensive Player of the Year award. As the team’s only star he led the Spurs to the 1995 conference finals (where he was destroyed by Hakeem Olajuwon- no need to discuss that here) and was a central figure in the Spurs first-ever championship season in 1999, averaging 15.8- 10 in both the regular season and the playoffs. He would also collect a second ring in 2003, his final season, this time a much more complementary role, as he averaged just 8.5- 7.9 that season. Robinson is one of three players to average a double-double during his Spurs’ career, and is still the franchise’s all-time leader in games played (987; 10 more than Duncan), points (20,790; 149 ahead of duncan) and blocked shots (2,954; 719 ahead of Duncan), Meanwhile, Robinson still ranks second, behind Tim Duncan, in rebounds (10,497)- a spot he’s unlikely to surrender any time soon.